How to Build Preset Settings on HandBrake 0.10.0 for iPad Air 2? How to Build Preset Settings on HandBrake 0.10.0 and later for Apple iPad Air 2? HandBrake is a well-known tool for video conversion. On August 18, HandBrake 0.10.0 beta 4 has been released. This is a major update. The new HandBrake is optimized in many aspects, like Intel QuickSync Video Encode/Decode support, Hardware Decode support via DXVA, Denoise, add Windows Phone 8 Preset, etc. It is worth noting that some updates are only available for Windows. There are big improvements in HandBrake 0.10.0. However, it still not provides preset settings for particular devices, such as iPhone 6/6s, iPad Air 2. Due to strict video encoding guidelines in Apple devices, it is suggested to add iPad Air 2 preset settings into HandBrake 0.10.0 before converting video or DVD to iPad Air 2. Read the following guide to see how to build preset settings on HandBrake 0.10.0 for iPad Air 2. Rip any DVDs, even those copy protected ones, to common media formats for playback on popular devices, like iPad Air 2/3. iPad Air 2 was introduced to the public in October 22, 2014. It features A8 processor, 9.7 inches display, a resolution of 2048x1536, an 8MP main camera, a 1.2MP front camera, Touch ID and "anti-reflection coating". If you're considering getting an iPad Air 2, it's time to learn how to create iPad Air 2 settings on HandBrake 0.10.0 to convert video and DVD to iPad Air 2 playable media formats. Step 1. Hit Win+R, then paste %appdata%\Handbrake to open HandBrake folder. And then you'll be presented with two preset files in the folder: presets.xml and user_presets.xml. These two folders contain HandBrake original presets, including iPhone, iPad, iPod touch, Apple TV. Right-click and open user_presets.xml with notepad. Step 2. Delete all original content and replace the tags below, then save and close notepad. Step 3. Reopen HandBrake, and you'll notice that HandBake iPad Air 2 preset is already listed in its Presets window. Tip: You can also use this method to set Handbrake profiles for iPad Pro and iPad mini 4/2. After finishing iPad Air 2 settings on HandBrake 0.10.0, you can use HandBrake to convert video or DVD to iPad Air 2 with ease. However, profile setting isn't an easy task for everyone, especially for the non-professionals. It is hard for the ordinary to understand the technical words, let alone setting parameters. You may find HandBrake preset settings for particular device model in the internet, but undoubtedly it is very time-consuming and laborious. What's more, despite of powerful DVD ripping and video converting ability, HandBrake including the latest version 0.10.2 is always complained due to various unexpected HandBrake errors, like AVI to MP4 converting problem, HandBrake crashes before finishing, No Titles Found, DVDs only rip half way, Error Opening and more. Considering of these things, many people prefer to rely on professional and easy-to-use HandBrake alternatives for converting videos or DVDs to iPad Air 2/iPad Pro/iPad mini, iPhone 6/6sSE//7, iPhone 6 Plus, Samsung Galaxy Note 4, Galaxy Note Edge, and other devices. WinX DVD Ripper Platinum comes as the first recommendation as HandBrake alternative, due to a variety of strengths over HandBrake, even HandBrake 0.10.2. WinX DVD Ripper Platinum excels in ripping and converting regular and encrypted DVDs to all mainstream media formats, such as MP4, MOV, AVI, WMV, MKV, FLV, M2TS, and M4V. Thanks to hundreds of preset device profiles, users can directly convert DVDs to iPad Air 2/Pro/Mini, iPhone 6/6s, iPhone 6 Plus/6s Plus/SE/7, Samsung Galaxy Note 4/Edge, Amazon Kindle Fire, HTC, Google Nexus 7, WP8, Xbox, PSP, Blackberry, and other fashionable devices. However, HandBrake can rip unencrypted DVDs only to MP4 or MKV, and doesn't provide presets for popular devices. That is to say, you cannot use HandBrake to convert Disney movie DVDs or other popular commercial DVDs, like Frozen, Maleficent, How to Train Your Dragon 2, Transformers: Age of Extinction. Moreover, WinX DVD Ripper Platinum also enables users to extract audio file from DVDs, convert DVD to YouTube, Facebook and website supported formats for uploading, and back up DVDs for DVD collection and safe storage. This is not only a good HandBrake alternative for iPad Air 2, but also a HandBrake substitute for all devices. 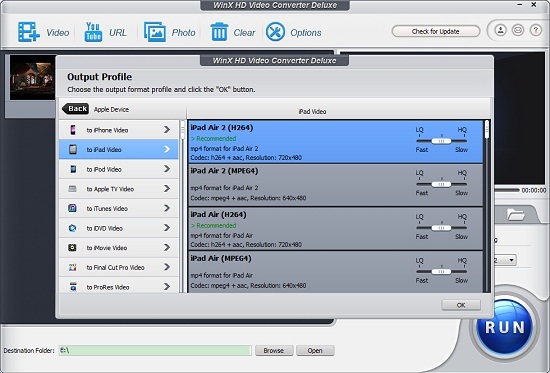 When it comes to video converting, WinX HD Video Converter Deluxe is the best HandBrake alternative. HandBrake can convert common multimedia files to MP4 or MKV, while WinX HD Video Converter Deluxe can convert among almost all SD (AVI, MPEG, MP4, WMV, MOV, VOB, FLV, RMVB, WebM, etc.) and HD videos (MKV, M2TS, AVCHD, MOD, HD camcorder videos, Blu-ray videos, etc.). Moreover, WinX HD Video Converter Deluxe is built in 410+ preset device profiles in order that people can convert videos for playing on iPad Air 2/Pro/mini, iPhone 7/6s/6/6 Plus/5S, Samsung Galaxy Note Edge/4, Google New Nexus 7, Sony Xperia, WP8, etc. It is also worth noting that it is easy to encounter HandBrake errors while video converting, while WinX HD Video Converter Deluxe is capable of converting any videos smoothly and quickly due to multi-core CPU supported, Safe Mode and other technologies applied. Furthermore, WinX HD Video Converter Deluxe also serves as a free YouTube video downloader, a photo slideshow maker and video editor. To sum up, if you can create iPad Air 2 preset on HandBrake 0.10.0 and later versions, you can try HandBrake to convert videos and DVDs not containing any copy protection. But if you are fed up with complicated preset settings on HandBrake and HandBrake errors, the aforementioned HandBrake alternatives are the best ways to go. WinX HD Video Converter Deluxe - Convert SD/HD videos to PC/Mac/iPhone/iPad/Android/Windows phones & tablets supported file formats.